Megan's Tiny Treasures: No Barking! It's late in the evening but I promised, so here it is, the first images for Puppy Love. This is our 2012 Valentine workshop. The workshop will be held at Tin Soldiers on 11 and 12 February, and in Randburg at Elaine's studio on 24 March. We are open for bookings! 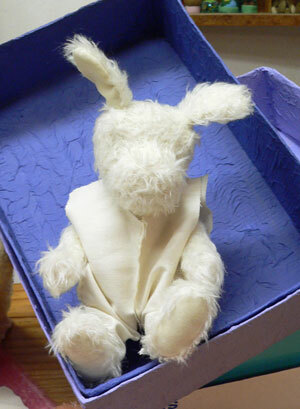 The puppy is made from mohair, about 28cm tall, and will have lots of painted detail, coming tomorrow! At the moment it looks like a little ghost. 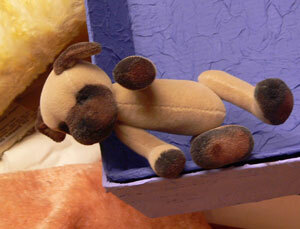 Here I used the same pattern and miniaturised and adapted it to make a pug. It is not part of the workshop, but I will be showing you how to create many dog breeds from the basic pattern. Puppy Love wears a romper. I have hand painted the fabric to get the exact design I want. 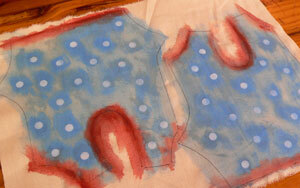 This is part of the workshop, you will have the opportunity to paint your own fabric in class. There are more accessories, I will have pictures of that soon. Can't wait, Megan!! LOVE the little doggie. want to do this too....looks great!